This cute storage box combines your favorite glasses and sunglasses and is easy to find. The 8 compartment glasses display case is made of PU, MDF, glass and lint to protect your glasses when stored. Simply store your glasses inside and place this storage box on any dressing table or bedside table to keep your glasses organized and beautifully displayed in your home. It can not only store glasses, but also can store other small items. 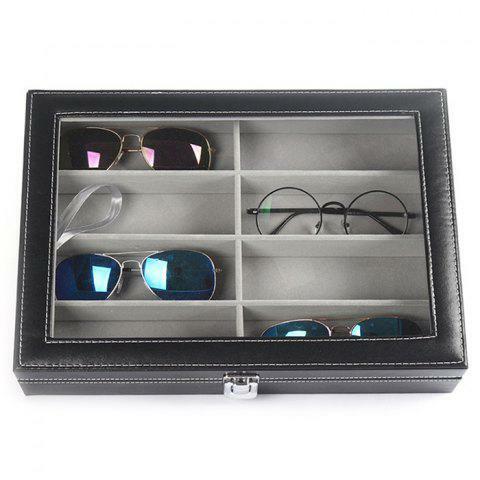 High-quality materials: The sunglasses storage box is made of PU leather, MDF, glass and cotton velvet. It is moisture-proof, easy to clean and durable. Space saving: 8 slots glasses case, which can hold the glasses in place and keep the glasses neat and ready for your use. It is a delicate accessory for bedside tables, desks or dressing tables. Protection: The glasses storage box protects your glasses from scratches; store them carefully and organize up to 8 pairs of different glasses. Multi-purpose: Suitable for storing and displaying your favorite glasses and sunglasses in a convenient place, or you can use this to store other small items such as ties, coins, jewelry, etc. Compact and convenient to store and carry.